A South Dakota man became a social media pariah after posting his offensive costume online. 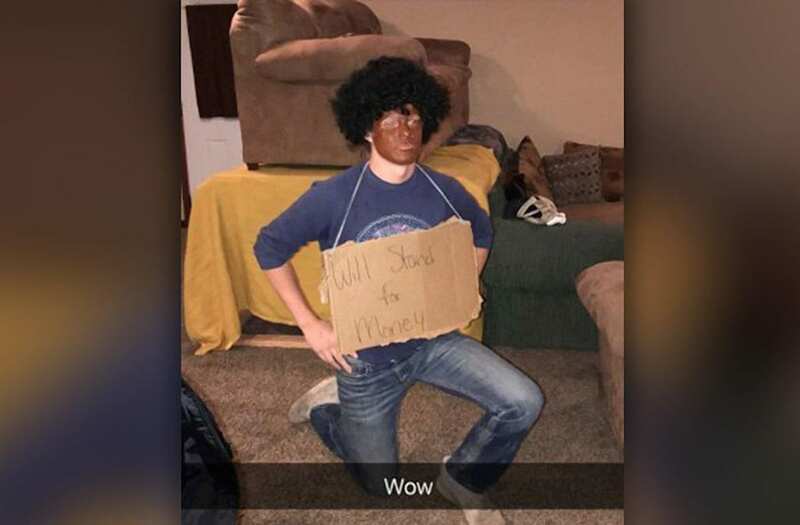 Cole Paulson was hit with ridicule from all angles when he shared a picture of himself sporting an afro-wig, blackface and a sign reading "Will Stand for Money." In the photo, posted over the weekend, he's posing down on one knee in an attempt to take a shot at Colin Kaepernick, who began protesting police brutality in 2016 as part of the San Francisco 49ers, and other athletes continuing the demonstration. Twitter users called him "a disgusting racist person" and "ignorant," among other things. Some went as far as to contact South Dakota State University, where Paulson claimed in his Twitter bio he attended, urging them to remove him. Ariel Winter attended Matthew Morrison's 8th Annual Halloween party presented by PAC SUN and Podwall Entertainment at The h.wood Group's Poppy over the weekend. Nas, dressed as Richard Pryor, attended a bash at Goldbar where the crowd enjoyed themed cocktails made with Tequila Don Julio. Paris Hilton attends treats! Magazine's 7th Halloween Party in Partnership with Rolls-Royce Black Badge, Absolut Elyx, & Perrier Jouet on October 31, 2017 in Los Angeles, California. EJ Johnson, Magic Johnson's son, stunned as Daenerys Targaryen from “Game of Thrones" at the fnktion launch debut. Amid the backlash, Paulson made his Twitter account private. Before doing so, he defended his actions in a series of tweets, assuring those offended by the costume that despite sporting blackface, his "intentions were not racist whatsoever." He also released a statement to ABC News affiliate station KSFY claiming he was ignorant to the fact that blackface was rooted in racism. "I was ignorant to the fact I was being racist and did not know the implications as to what I was doing. I had zero racist intentions and I deeply apologize to anyone I offended," he told the station. "I've received dozens of threats on my physical wellbeing in the last 24 hours many threatening to take my life so I'd prefer to not have any more exposure. I meant no harm and all I have gotten is pure hatred towards me today when in reality I was not trying to show any hate last night." Paulson has been contacted by representatives from SDSU's Office of Diversity, Equity and Community, though according to KSFY, he doesn't attend the university. Although it may be obvious to some how offensive costumes such as Paulson's are, he's not the first to don a racist portrayal of Kaepernick, 29, this Halloween season. On Monday, University of Nevada, Reno, Police Chief Adam Garcia issued an apology after a photo of one of his officers wearing an inappropriate costume intended to represent the NFL player began making its rounds on Twitter. UNR spokeswoman Kerri Garcia told the Reno Gazette Journal that the officer will not be punished for his "insensitive" costume.